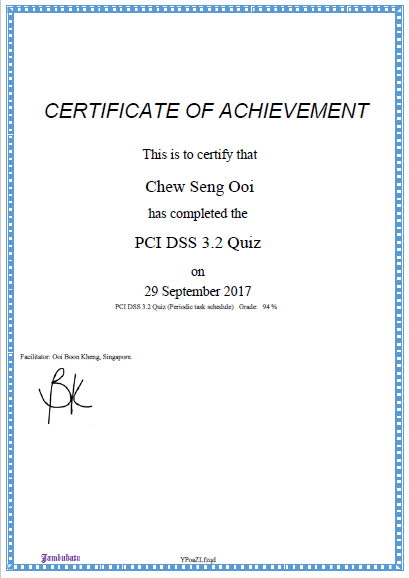 This is a test quiz on the standard, PCI DSS v3.2. It tests your understanding of the requirements of the standard. The quiz features are as follows. The test quiz is built on the Moodle platform. The target audience is all QSA-to-be, ISA-to-be, QSA refreshee, and ISA refreshee. There is a time limit of 40 minutes. The number of questions are 36 questions from the database, each time the system randomizes different questions to appear. The question format is multiple choice answer. Try it now! Here is the link: http://jambubatu.com/moodle34/login/index.php. Login in as visitor with the password as Visit0r*. Get the Quiz password from bk@jambubatu.com. Here are the Periodic Tasks Schedule.